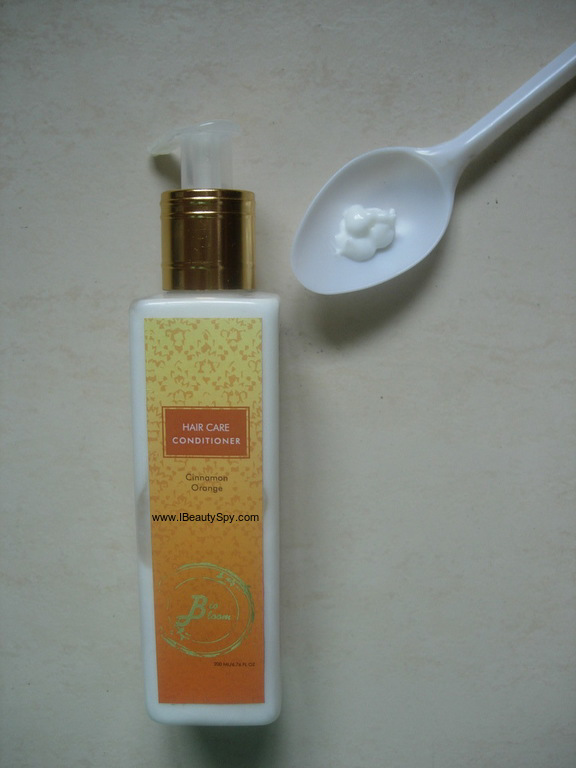 Its been a long time since I reviewed a hair care product in my blog. So today I thought of reviewing my current favorite hair conditioner. Its from the brand BioBloom. I have tried couple of BioBloom’s body oils and hair cleansers and quite liked them. 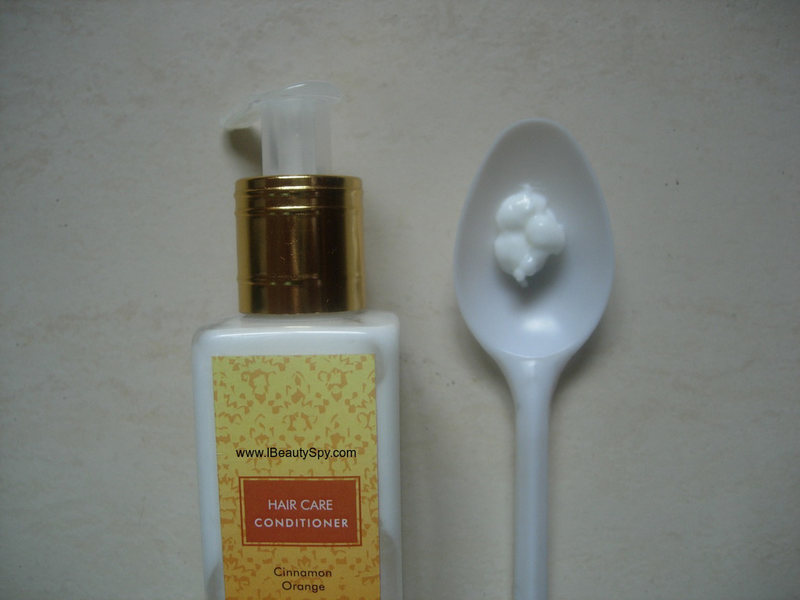 If you have oily scalp, then do try their Ginger Hair Cleanser. All their products are free from parabens, sulphates, formladehydes and petrochemicals. Also they are cruelty-free. 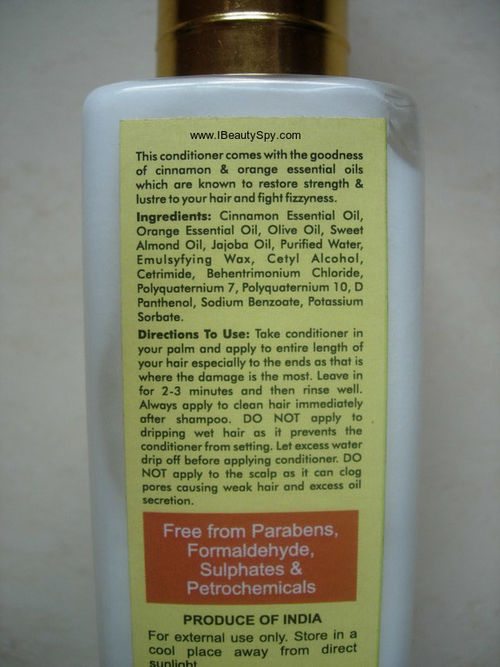 So let’s move on to today’s review of BioBloom Cinnamon Orange Hair Conditioner. This conditioner comes with the goodness of cinnamon and orange essential oils which are known to restore strength and lustre to your hair and fight frizzyness. BioBloom Cinnamon Orange Hair Conditioner comes in a tall plastic bottle with a pump dispenser which is very convenient. The bottle is translucent and you can see how much of the product is still left. 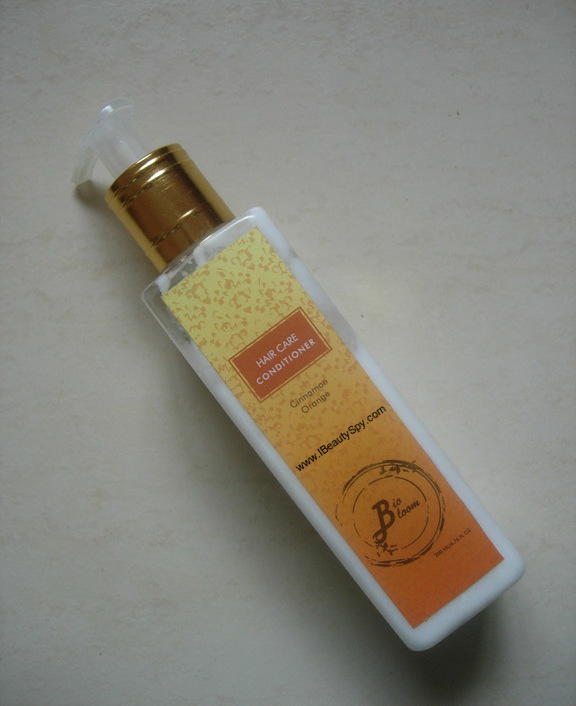 BioBloom Cinnamon Orange Hair Conditioner looks white in color and has a mix of citrus and warm scent. Smells exactly like oranges and cinnamon. The orange is slightly more predominant. This is such a refreshing scent to have in a haircare product. But the fragrance stays in your hair subtly only for 6-7 hours and then it goes off. The consistency of the product is thick and creamy. As per directions, you need to let excess water drip off before applying this conditioner. Using it on dripping wet hair can prevent the conditioner from working as expected. I squeeze the excess water out of my hair after shampooing and washing using a towel and then apply BioBloom Cinnamon Orange Hair Conditioner . You can adjust the quantity of the conditioner depending on your hair type. If I haven’t oiled my hair and its very dry and frizzy, then I need about 4-5 pumps of the conditioner for my waist-length hair. Else 3 pumps are enough usually. If you have shorter hair, then 2 pumps should be enough. I apply it throughout my hair lengths and let it seep in for 2-3 minutes. And then I wash my hair. Regarding its claims of adding strength to hair, I have noticed it. It has reduced my hairfall and my hair overall feels stronger. I think it is due to the addition of olive oil, almond oil, jojoba oil and cinnamon oil. It takes some time to show the effects, but you can feel the difference. * Free from parabens, silicones, formladehydes, petrochemicals, artificial colors. * Makes hair smoother and frizz-free. * Helps in easier detangling. * Adds little shine to hair. * Doesn’t weigh down fine, thin hair. * Effects last for 3-4 days atleast. Longer if you use more quantity. * Makes hair stronger and reduces hairfall. * Contains good ingredients for hair like cinnamon, olive oil, almond oil and jojoba oil. Yes, if you are looking for a natural, silicone-free conditioner. No. I would like to try conditioners and masks from other natural brands. I feel its slightly on the pricey side. Thanks for sharing this! Looks like a promising product.